I picked up my iMac back in 2011. As usual with Apple products I ordered the smallest RAM possible and picked up some Crucial to take it to 16GB. At the same time a colleague was also buying an iMac so I passed on the Apple RAM at a low cost to him as it was no use to me. That was my first mistake. Over the last year I was getting infrequent crashes, every 2-3 weeks, almost always when iTunes was running. I put it down to software and looking at the crash dumps I was always drawn to a graphics card driver issue. I dismissed it as that, hoping an OS X update at some point would resolve it. It didn’t. That was my second mistake. At Christmas I dug deeper, downloading a memory module checker and checking the RAM chips individually. Turns out I had some faulty RAM and that was something that I had introduced to the system. I bought some replacements (RAM is ridiculously cheap now) and in the last three months I have had zero crashes. Happy days but a lesson learnt. I’d still recommend buying a Mac with the minimum amount of RAM assuming you can easily replace it, but keep the Apple original in case your replacement chips are faulty and if you ever have to return the Mac to Apple. One aspect I’ve loved with the iMac is the screen. 27 inch and with a resolution of 2560×1440 it’s been a joy to use. Despite it’s size though, I’ve often wished for more. A second screen would really help day to day and especially with the podcast. 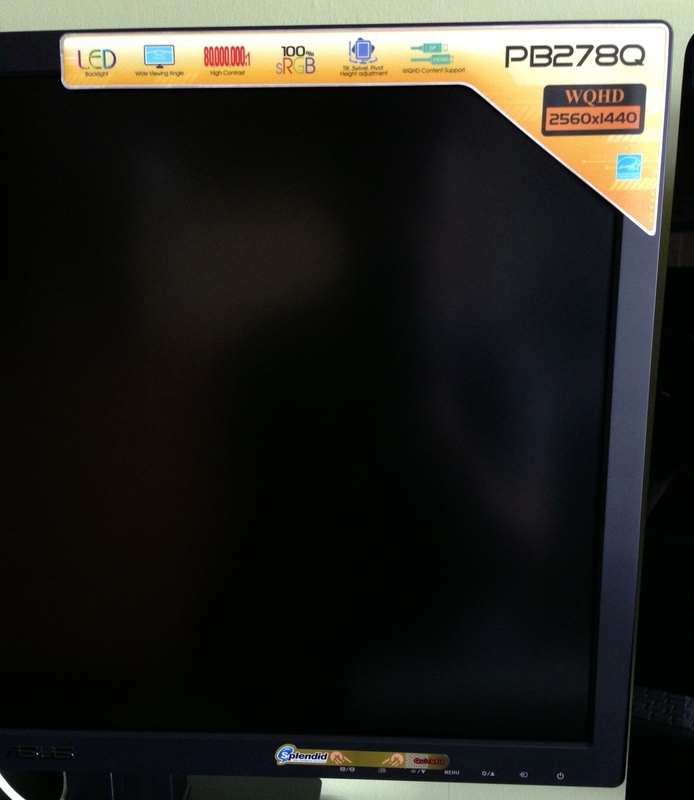 After thinking and researching for a while I finally plumped for the Asus PB278Q. Why do manufacturers persist with tacky stickers? I’m quite picky about the kit I use and while it would have been fine I’d have always been a bit ticked off with a physically smaller second screen or one with a lower resolution. The Asus is a 27 inch screen which is the same size as the iMac and also shares the same resolution – 2560×1440. Another obvious choice would have been the Apple Thunderbolt Display but that costs £899 and has no flexibility when it comes to adjusting screen height. The Asus is fully adjustable and can be rotated 90 degrees too. It also cost £467 from Amazon which is a massive difference to the Apple Thunderbolt. Other options were from Dell and Samsung. Although Dell have been making monitors for years looking at recent reviews and also customer comments on Amazon there seems to be an issue with quality control and although most were happy with the product, there were too many who had real issues with their monitors. As for Samsung, it didn’t look the best, the Asus had far better reviews…and it was a Samsung :-). First impressions out the box were good. Design wasn’t a patch on the iMac but it was sturdy with a good base. The only initial negative was the garish stickers that PC manufacturers love to put on cases, laptops and monitors. Thankfully they were easy to remove leaving just the button indicators, the ASUS logo and the unnecessary HDMI and DisplayPort logo’s on the front. When will they learn. The material is black matte plastic and although the bezel is a touch larger than I would have liked, it does melt into the background in use. The Asus comes with lots of connectivity options – HDMI, DisplayPort, VGA and DVI and admirably comes with a full set of cables in the box. However for the iMac I needed an mini-DisplayPort to DisplayPort but there are some great sub £10 options on Amazon. Setup was easy. Plugin the cable, power up the monitor and the iMac auto detected the screen and enabled an extended desktop giving a total resolution of 5120×1440. Thats a lot of pixels and brings me to my biggest fear when it comes to screens. Dead pixels. I shouldn’t really check as chances are in day to day use it would be unnoticeable…unless you go hunting, but hunting I went. Happily the Asus has no dead or stuck pixels. The screen itself is more matte than the iMac so reflections are much reduced. As for the screen itself I think it’s excellent. Clear and crisp, no noticeable lag with my ageing eyes and I can use it easily all day long without any tiredness. Applications were well sized, nothing too small or unclear and full screen video was crisp and clear – no smearing that I could see. I don’t really game too much on the Mac although have been bitten by the emulator bug over the last couple of weeks, but that’s for another post, but the games I tried all played well. The menu controls are easy to use and give you full control over screen colour, brightness etc and also allow you to flick between a number of presets. 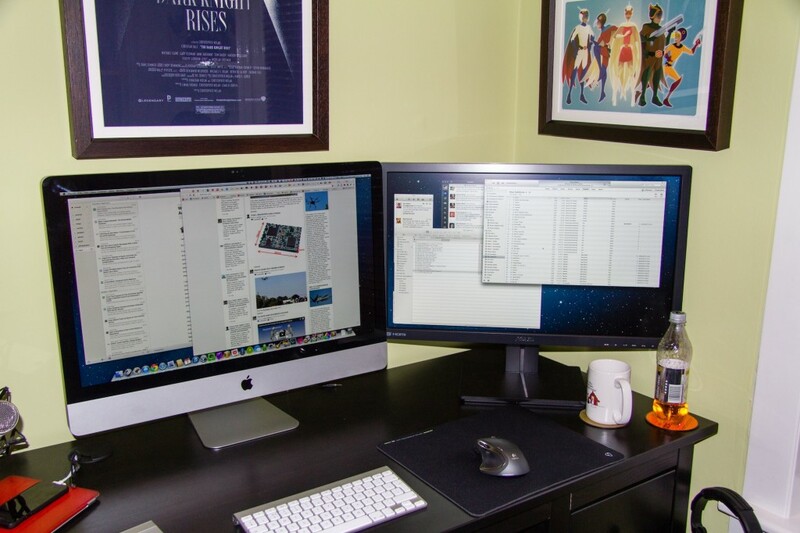 It was straightforward to match the iMac display so it looked roughly the same to my eye’s. You can also control audio levels as the monitor has built in speakers which are ok, but nothing spectacular. You can alter menu positions, menu language and also turn off the power light indicator which makes the display on the front of HDMI and DisplayPort logo’s even more annoying. I might have to find some black tape. 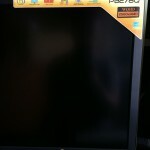 Apart from that I’ve nothing more to say technically about the monitor and I’ll point you to TFT Centrals review of the PB278Q which is incredibly detailed and covers all aspects of the monitor. Suffice to say, they liked it. I’ve had the monitor for a week now and love it. It’s a luxury purchase but delivers a big gain in productivity. 2 years ago I was sure I didn’t need anything more than a 27 inch monitor, I’m now pretty sure that I don’t need a third monitor…but in 5 years time will it be two retina monitors? Time will tell. Above & Beyond: Group Therapy (iTunes link) – Weekly 2 hour mix show, highlighting the finest in trance. Great for getting through boring tasks at work. We all have them! Accidental Tech Podcast (iTunes link) – Relatively new technology (especially Apple) podcast featuring Marco Arment, Casey Liss and John Siracusa. Can go deep on topics but really enjoyable so far. All About Android (iTunes video link) – Weekly show that features news and app’s from the world of Android. Great way of keeping up to date. Answer Me This! (iTunes link) – Helen and Olly, answer me this….funny and rude – a must listen. Before You Buy (iTunes video link) – Gadget review show which can be a bit hit and miss depending on reviewer. CMD+Space (iTunes link) – A tech interview show from Myke Hurley. Had a great run of guests making this a really enjoyable show – Myke has real skill at getting the most out of his guests too. The Crossover (iTunes link) – Hosted by Dan Benjamin and featuring a variety of hosts from 5by5 discussing…anything. Great episodes so far. Fighting Talk (iTunes link) – Colin Murray hosts, 4 guests from the world of sport and 50 minutes of comedy gold. Foundation (iTunes video link) – Kevin Rose interviews founders, entrepreneurs and business leaders in the tech community. Roughly a monthly release cycle, Rose has had access to some great people over the years. Frame Rate (iTunes video link) – How to watch Internet TV and what’s worth watching right now. Tom Merritt and Brian Brushwood are great hosts. Friday Night Comedy from BBC Radio 4 (iTunes link) – Topical news quiz featuring The News Quiz or The Now Show. Much prefer the News Quiz hosted by Sandi Toksvig. In Beta (iTunes link) – Podcast on tech culture, open source and web apps. Not just a tech news podcast and some interesting topics covered. Invisible Walls (iTunes video link) – Videogames podcast, a bit hit and miss but best of a bad bunch. Mac Power Users (iTunes link) – Hosts Katie Floyd and David Sparks take one topic each week and discuss it in detail. Mac focussed and some great software links and tips to get the best out of your Mac. MacBites (iTunes link) – MacBites is hosted by Elaine Giles and Mike Thomas and is that rare beast – a UK podcast! Informative but great fun at the same time – I love it. Weekly but with frequent breaks, their absence kicked me into doing DigitalOutbox. Macbreak Weekly (iTunes video link) – A once classic podcast when Merlin Mann took part, stil watchable thanks to Andy Ihnatko and Rene Ritchie. Can go long…too long. The New Disrupters (iTunes link) – Hosted by Glenn Fleishman this podcast focusses on how the economy is changing and each week he interviews a disrupter who is taking advantage of the new economy. On The Verge (iTunes video link) – Monthly video magazine from The Verge, part gadget reviews, part chat show with great guests. Shift Run Stop (iTunes link) – Much loved and much missed, a geek/comedy podcast hosted by Leila Johnston and Roo Reynolds. Tech, gaming, geek culture, UK based and two delightful hosts. And fun. The Talk Show (iTunes link) – Hosted by John Gruber each week he discusses mostly Apple related subjects with a guest or two. Miss the old days with just him and Dan Benjamin. Tech Weekly (iTunes link) – Well produced weekly tech podcast from the Guardian. This Week in Google (iTunes video link) – Jeff Jarvis and Gina Trapani discuss Google and cloud computing in general. Jeff is great – really refreshing voice. This Week in TECH (iTunes video link) – Can go long and is very much dependant on the guests but is generally a good round up on the weeks tech news. Top Shelf (iTunes video link) – David Pierce from The Verge looks at a variety of tech and gadget issues. New but good so far. Unprofessional (iTunes link) – Dave Wiskus, Lex Friedman and guests discuss anything. Very good. The Vergecast (iTunes video link) – Weekly tech and gadget show from The Verge. The Wired.co.uk Podcast (iTunes link) – Weekly tech and science podcast from Wired UK that keeps getting better and better. So thats what I currently subscribe too. I dip into others as they are linked or mentioned elsewhere and of course I couldn’t write a post on podcasts without mentioning DigitalOutbox in which you can hear my good self and friends ramble on about the weeks tech news but with a distinctly UK focus. I love finding new great podcasts so if you think there is something I would like please leave a link in the comments.